It seems that today’s trend in majority of blogs and websites out there is minimalism. It is very understandable — tacky and overly “creative” designs on websites can downright be annoying. Many websites try to be everything at once, causing visual overload to many of its visitors. Finding the right balance in designing a theme seems to be very difficult for many people, which is why people just opt for minimalist themes that are clean, simple, yet visually breathtaking. It doesn’t really mean that the design is plain — the organized and sleek look is actually very pleasing to the eyes. WordPress, the biggest website building content management system nowadays for its reliability and convenience, has many themes that ride the minimalist bandwagon. Although minimalist, they offer different services for different uses, may it be for business purposes or just for your own personal pleasure. Anyone can use it — if you are using it for business, the minimalist design will not stop you from customizing your site to fit your brand. For bloggers, the minimalist design will just help highlight the content of your website. The following are the best minimalist WordPress themes of 2017. Created by DecaX studios, Notumn is your standard minimalist theme -- clutter-free at its best. Notumn is also multi-purpose, whether you want to use it for personal or “professional” blogging, a portfolio, photo essay writing, or what not. It can even be used to put up an online shop. Notumn’s minimalist interface translates very well to mobile devices as it is highly responsive. 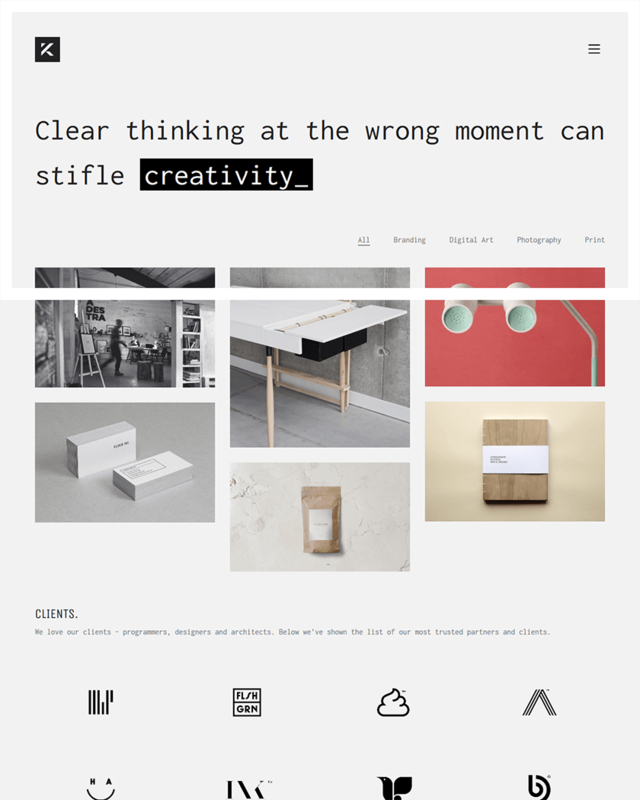 Although minimalist, it still allows the user to have control on the appearance of the site. The user can choose to change the typography, colors, layouts of other pages, as well as enable or disable elements. Another good feature of Notumn is that is supports MailPoet which makes it easy for users to create their own newsletter. In addition, your all-time favorite photo-sharing app, Instagram, is also supported. It even has a Disqus plugin to allow comments from readers, creating an open line of communication between the user and the reader. 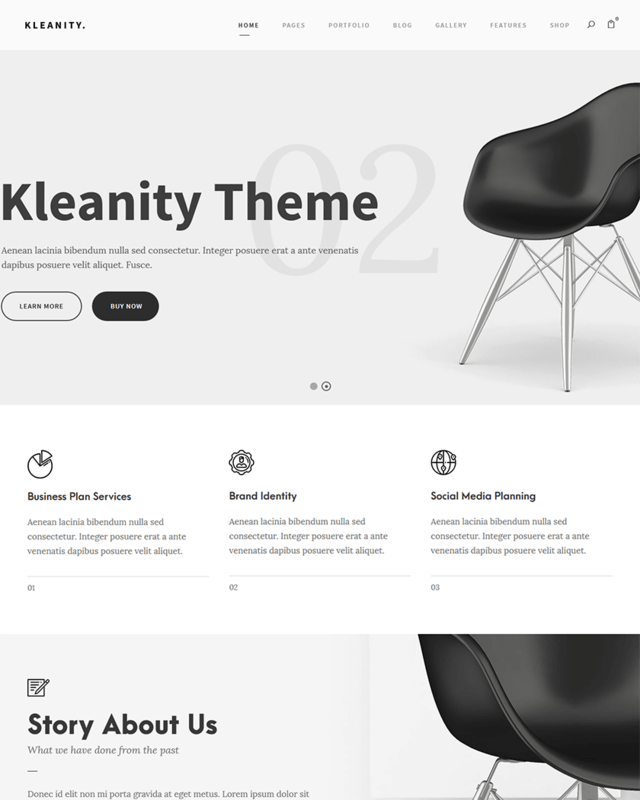 Kleanity is a minimalist WordPress Theme that has a clean and elegant interface, but has a lot of features packed in. Basically, it highlights the capacity for the user to be creative with the templates. Kleanity’s selling point is its page builder, powered by the reliable GoodLayers Page Builder. It is very easy to use, and its interface is user-friendly as it is drag-and-drop. In addition to the GoodLayers Page Builder, Kleanity has 19 different header styles to choose from, so it can suit your preference or needs. It also has unlimited sidebars, and you can choose from a wide range of Google Fonts. However, if you have your own font that you can’t find on Google Fonts, Kleanity allows you to upload your fonts and use them to decorate your website.You can also use this Minimalist WordPress Theme for setting up your online shop since it is also WooCommerce-ready. 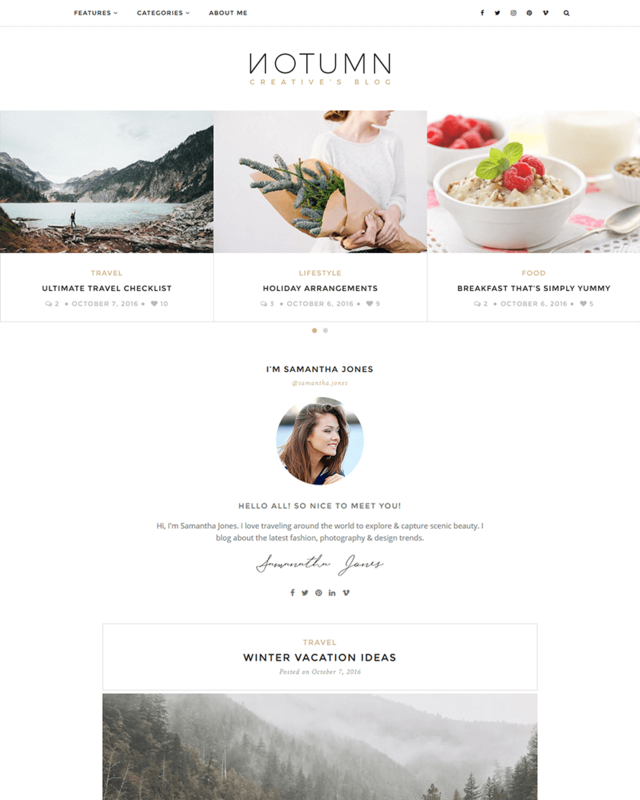 Sleek and elegant, Houston is perhaps one of the best-designed Minimalist WordPress Themes out there. Aside from the usual white interface, Houston uses a charcoal gray interface that makes the website look professional and modern. Although it can be used for personal blogging, it is perfect for creative artworks, portfolios, and even online shopping since it uses a MegaMenu that allows for a wide range of categories. To make it easy to customize, Houston uses MotoPress Editor, a plugin that helps with the editing process. In addition, the entire theme is SEO-ready, which is good for online shops, freelancers, and other businesses since they can maximize this for easy look-up from potential visitors. It also has a contact form to make transactions through the website a whole lot easier. Houston is also compatible with any major browser out there so your visitors can see the beauty of your website in spite of the type of browser they are using. As the name suggests, Elegance really is an elegant minimalist WordPress Theme, but the interface is not out of the ordinary, especially among minimalist themes. Its goal is to look clean and clutter-free, and it achieves just that with its white interface. It also carries the standard features that most themes have now: it is responsive and translates really well on mobile devices, has a variety of banners for the user’s perusal, and can be used as an online shop if not for personal blogging, although the theme is perfect for online magazines. It is unique in some ways, too. It has an infinite scroll widget that not all themes have, and users can resize the sidebar width. What people who have used this theme noted is that customer support is exceptional, allowing for a really good experience for users, especially for beginners who are building their own website for the very first time. 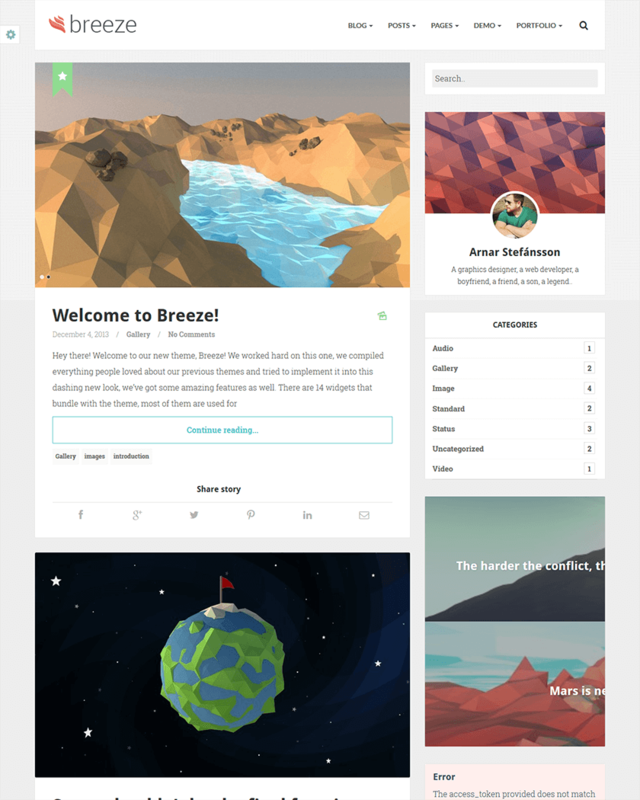 Breeze passes off as a minimalist WordPress Theme primarily because it is clean and simple. Don’t let the simplicity trick you though-- it is packed with unique features that only a few themes offer. One of the things that makes it unique is that it allows the users to have regular scroll-down blog to a layout that is similar to Pinterest’s. In addition, it has a face-tagging feature that allows readers to post comments about any part of the photo. It also helps that Breeze has social media support. Websites right now don’t just stand in isolation -- social media platforms complement websites, whether you are an individual brand or a business. For this support, Breeze has 14 widgets at the user’s disposal. The theme allows the entire site to be translatable, allowing for a more international readership. Bloggers, and even businesses, will find Breeze’s Google Responsive Ads Widget extremely helpful as it even shows in mobile devices. Jolie is basically an online shop, an AJAX WooCommerce theme to be specific, with a minimalist design. 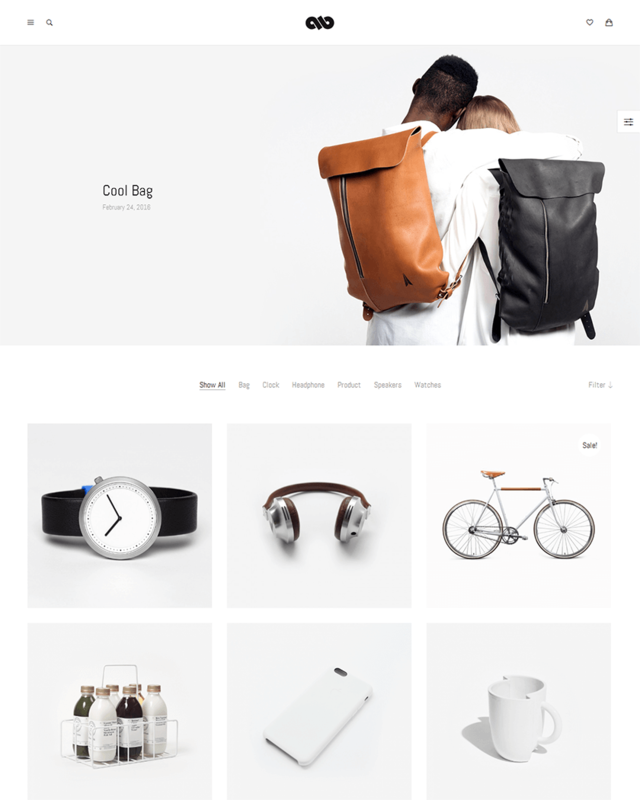 Although minimalist, it is fully customizable as well, but it is basically designed to sell fashion products. Because Jolie was designed to be an online shop, it has features that are precisely for selling. With Jolie, it is possible to filter products by categories, making it easy for shoppers to look for exactly what they want from your store. Filters include filtering by price, product tags, product categories, brand, size, and even color. It even has a search shop so visitors are not limited to just clicking categories until they reach the product they have been looking for. Jolie is also SEO optimized, which is perfect for online shops who want to reach a wider market online. Just quick search and your visitors might just land on your online shop and start browsing through your products. Focus is a minimalist WordPress theme that really values originality and creativity. This originality and creativity is evident in the design of Focus. It has a full width layout with a header and a footer. The footer makes use of a slider, which is not present in a lot of themes.Focus was designed primarily with creatives, artists, and freelancers in mind, as the interface is perfect for portfolio creation. 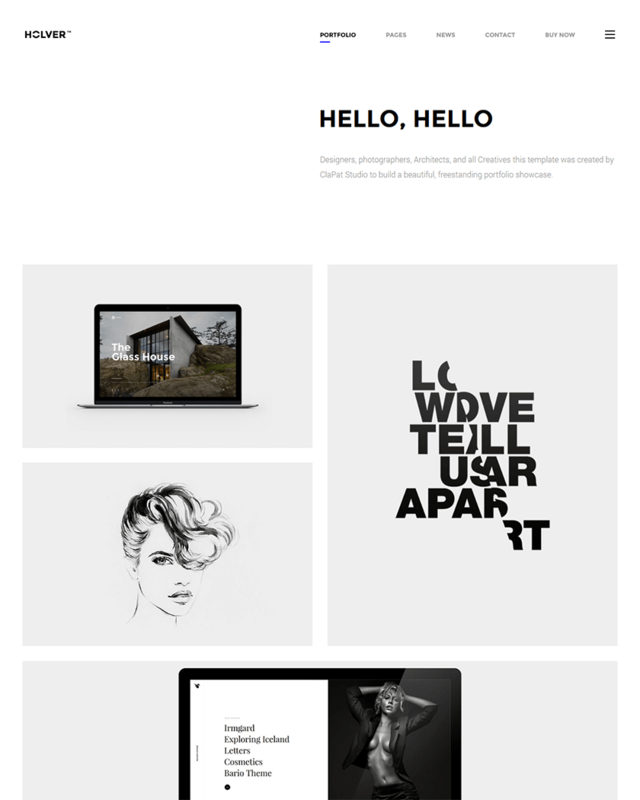 This minimalist theme offers a lot of layouts for the portfolio so you can really make an impact with your artwork. Though unique, Focus still bears the same standard features of most WordPress themes. For instance, it has a drag and drop builder for easy customization. To complement it, the theme has a live preview WordPress customizer so you can see the changes of your site immediately. For added customization, you can choose from over 700 Google Fonts. It has unlimited sidebars, premium sliders, and page options. It is also responsive and retina ready. ZMinimal is one of the most elegant multipurpose minimalist themes out there. It can be for regular blogging, portfolio creation, and also for online shopping. If you choose to use it as an online shop, you need not worry for plugins since it is WooCommerce compatible. ZMinimal has four layouts to choose from and a sidebar switch option in case you do not need it. It has coloring options for a more fun customizing experience. Some of the other features include the standard WordPress theme features such as being compatible with major browsers, compatibility with custom widgets, SEO optimization, and many others. Some really nice features of ZMinimal includes promo boxes, which is, again, perfect for online shops and a love post system. Perhaps the only downside for ZMinimal is that it has not been tested for compatibility with WPML, but a .pot file should do. Other than that, ZMinimal is definitely a good choice if you want an elegant and minimalist website. Kalium is sleek minimalist WordPress Theme that fits this generation. It could easily be a favorite among millennials who want a minimalist theme, but at the same time, quirky. The interface beautifully designed. The background image is full width, and the headers on the top consist only of links so it does not disrupt the entire image altogether. Millennials love customizing things, even the tiny details, and Kalium can give this to them. It has a font management setting that and over 4000 fonts available, even with premium fonts so you are sure that your website can be crafted just the way you want it. For easy customization, it has a visual composer, a revolution slider, and a layer slider. The mark of a true millennial is being international, and Kalium makes the website as international as the potential owner by making it multilingual. It’s no wonder Kalium is one of the highest-rated themes in the market. 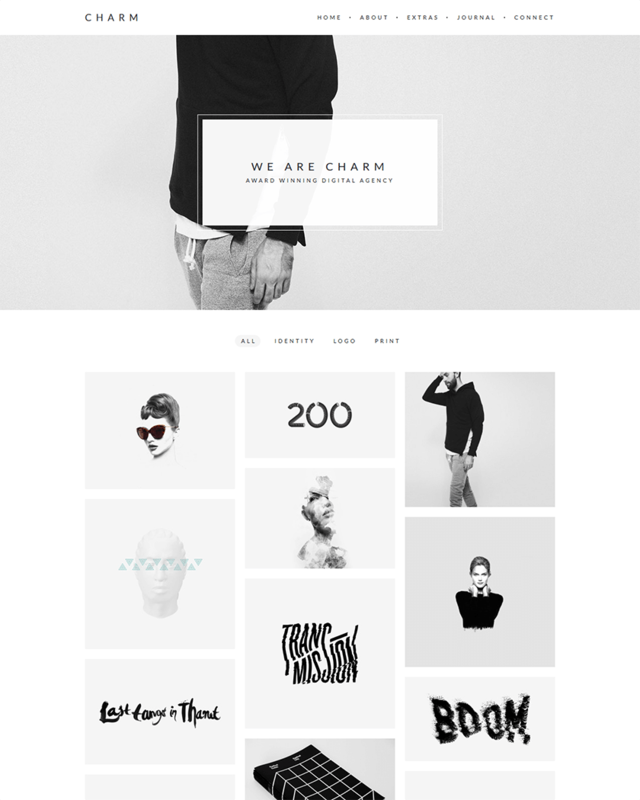 CheerUp is a WordPress theme that tries to combine minimalism and creativity in its design. This theme is designed to look different each time it is customized, as evident in its customization features, but the features it offers are generally standard. It has six unique designs that the user can choose from, plus over 200 layout variations, which is actually a lot compared to most of the minimalist WordPress themes out there. In addition to these layouts, CheerUp also has different layouts to choose from. It also has multiple sliders, footer and post styles, making it a whole lot easier for the user to have the freedom mix and match. It definitely changed the customization game. Although it is WooCommerce compatible, CheerUp is versatile enough to be used in a different way. There are many downloads out there that use the site as a personal blog, perhaps for traveling or even for fashion blogging. 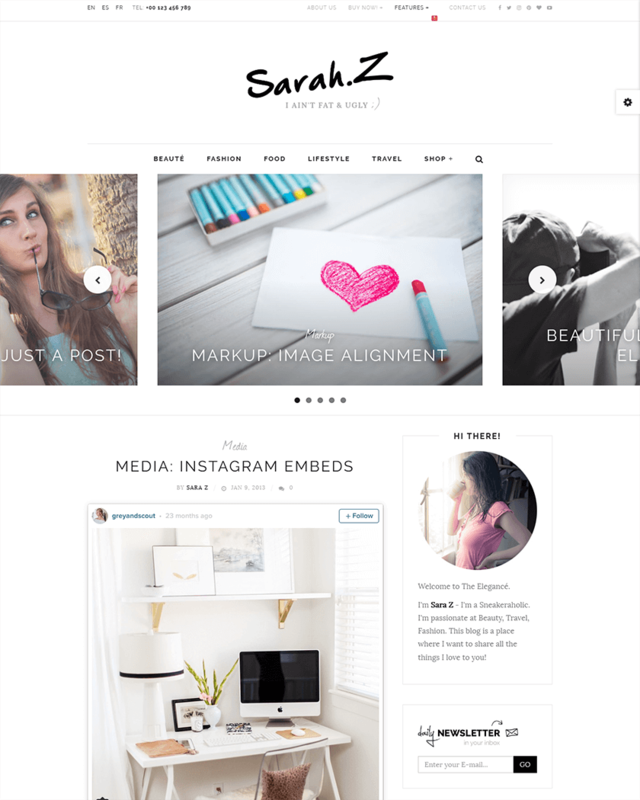 Savoy is a very basic, but impressively sleek, minimalist WordPress theme. It is also one of those modern minimalist WordPress theme that was designed for online stores. 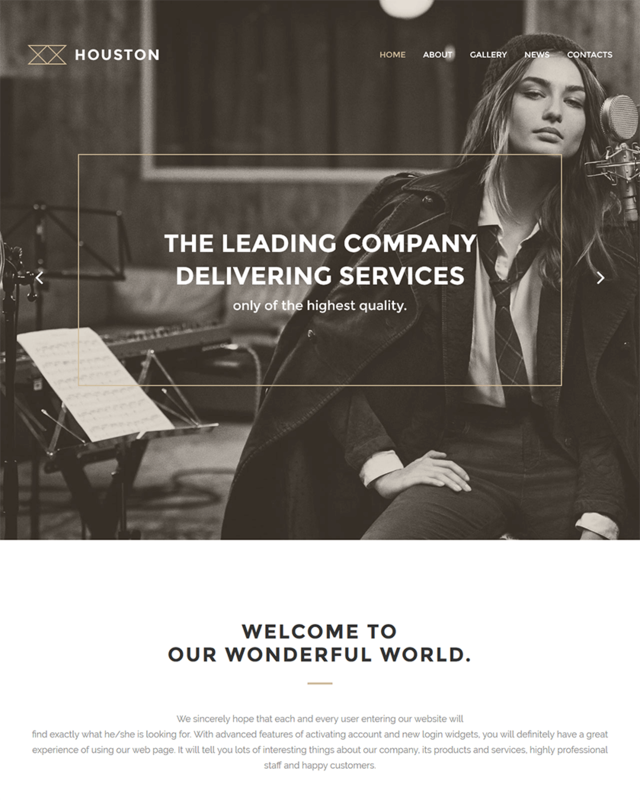 Savoy’s standard features include being responsive ready, especially for mobile layouts, a full width layout option, retina ready graphics, a product wishlist, and many others. What sets Savoy apart from most of the minimalist WordPress themes for online stores is how it is designed to be the optimal online store for the modern shopper. It has a multi column mega menu for more products, a log-in/register pop-up modal to keep loyal customers, a product quick-view feature, touch enabled sliders and galleries, featured product video which is useful for promotions, and mouse-over zoom/pan option for product images. Aside from these features, Savoy designers offer top notch support through free automatic updates, reliable support, simple installation and setup, an importable demo content, and extensive documentation. 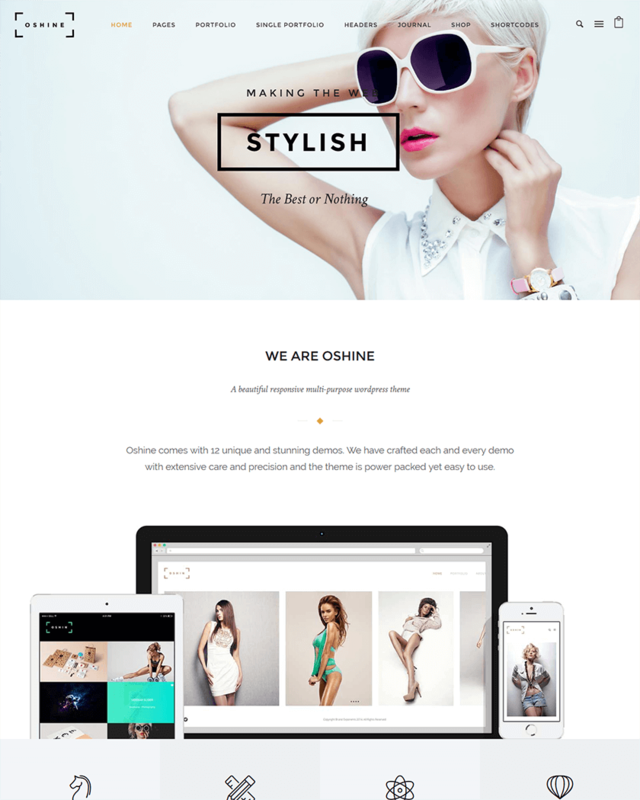 Carefully crafted by brandexponents, Oshine is marketed as a multipurpose, powerful, yet beautiful minimalist WordPress theme. Oshine can be applied for various purposes such as putting up an online store, polishing a portfolio for artists, setting up a company website, particularly in the creatives field, or simply using it for personal blogging. This theme also boasts of many features such as a page builder, the capacity to have unlimited portfolios, being fully responsive, and a user-friendly design. The developers have over 50 modules that are integrated in the page builder. The homepage of Oshine follows a full width layout that gives a very good impression for visitors of the site, especially if the image of the website is beautifully taken or created.The beautiful design of Oshine is demonstrated by developers with their 27 unique demos, a feat for WordPress themes in any category. Users who have downloaded Oshine noted the flexibility of this theme, making it one of the most versatile minimalist themes out there. 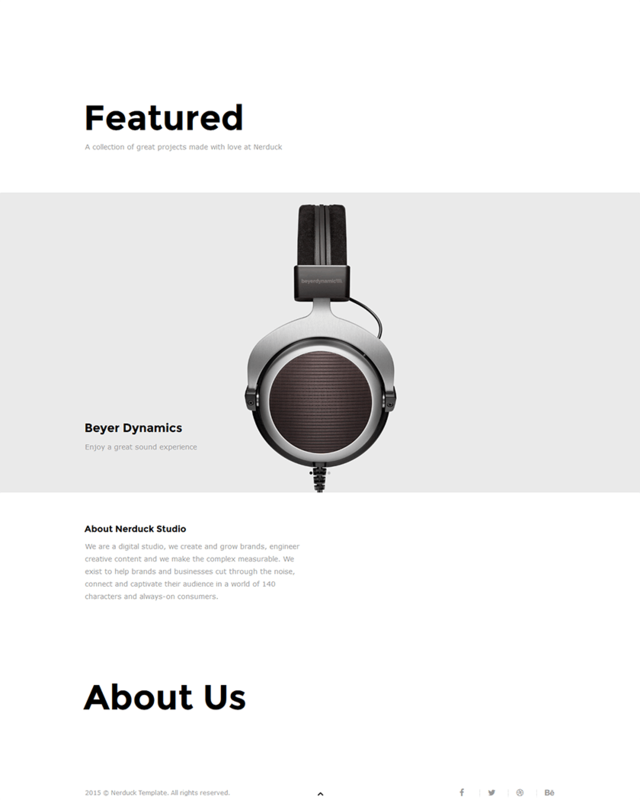 Nerduck is a very interesting minimalist WordPress theme precisely because it gave life to the term minimalist. Its design is simple: the homepage features a white background, a simple website title on the left side, and site content from below the title onwards. It employs a grid layout for the content, which is perfect for images. Precisely because of the grid layout, Nerduck is good for product shots or portfolio building as there is nothing distracting the visitor from anything else other than the images. Even though Nerduck’s layout is extremely simple, it still allows you to customize your theme through its theme options. The grid layout can actually be changed, turning it into masonry, items with or without margins, or your usual column layout. Its simplicity gives way to Nerduck being lightweight, allowing for a faster loading time, which is an advantage for users and visitors alike, while maintaining the beauty and elegance of the website. 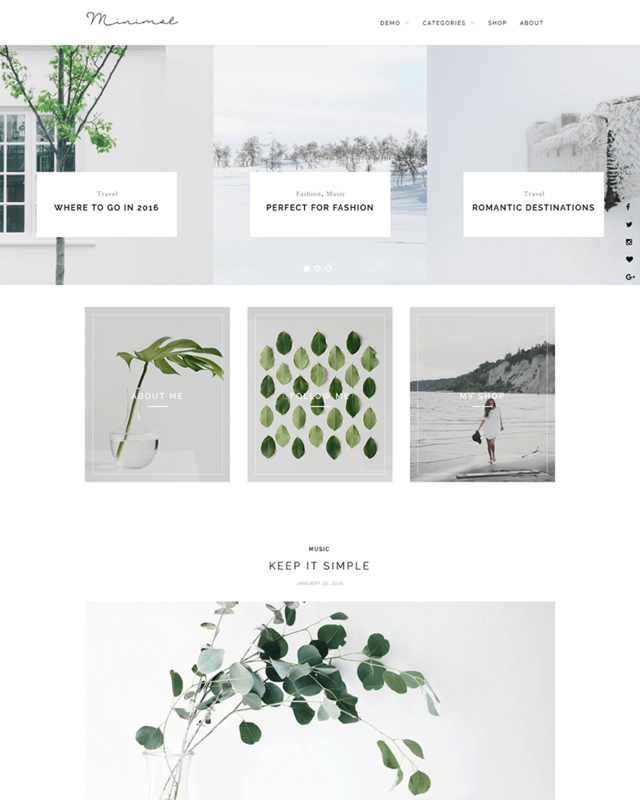 Charm is another minimalist WordPress Theme that upholds beauty, simplicity, and elegance above anything else, making it perfect for creatives -- whether freelancers or agency companies. The design has a header, a full width background image, and when you scroll down, you can see the site content which can be laid out as a grid. Developers of Charm likes to highlight how fully customizable the theme is. You can customize the website through WordPress’ Theme Customizer that allows you to see changes visually and in real time, helping you avoid mistakes. For creatives, it is also worth noting that Charm can accommodate unlimited portfolios that you can each edit in any way you can. It also seems that the developers have taken the time to keep improving Charm as there have been several versions of the theme, and users get updates of the theme for free. This way, users are ensured that they won’t have glitchy websites. Holver is a lot similar to Nerduck in terms of the default layout. Its clean, elegant, and simple, just like majority of minimalist themes. It does not differ so much in terms of features, too. Of course, there are differences in the layout, but overall, it is very reminiscent of Nerduck. Standard features of Holver include the capacity to perfectly translate the website in any mobile device, maintaining the beauty of the design; being retina ready; allows room for customization through over 600 fonts to choose from and many color schemes available; and being translation-ready. Perhaps a unique feature for Holver is the animated page transitions. Though seemingly standard yet still a beautiful theme, Holver ensures that its customer support is at its best, smoothing it out through a support ticket system and an extensively written documentation. As a theme, Holver seems to be perfect for product shots or portfolio creation. 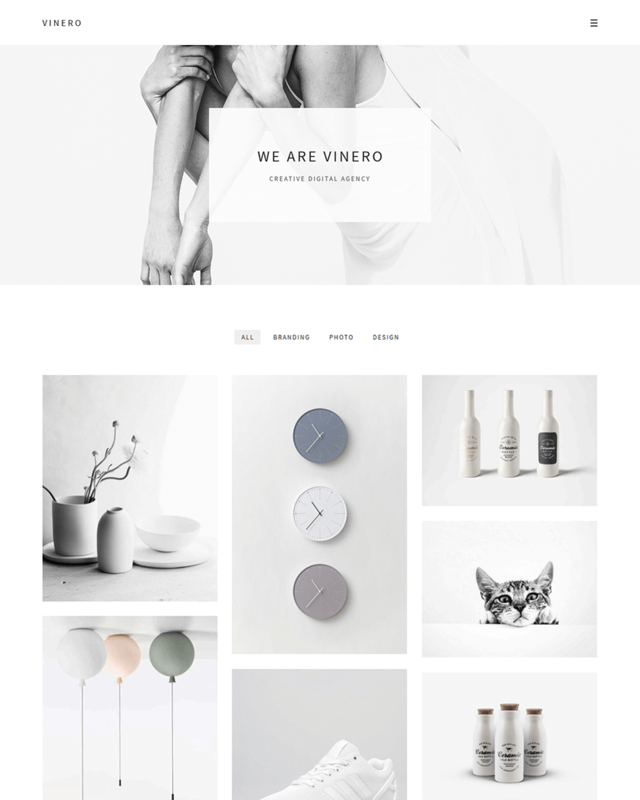 If Holver is similar to Nerduck, Vinero is a lot more like the Charm WordPress theme. Vinero, however, stands out in terms of the plugins it is compatible with. Vinero likes to highlight its premium plugins that would usually cost you a lot. These plugins are Visual Composer, Revolution Slider, and ACF Pro. Vinero plugins and add-ons can be bought from the Envato Market, a well-known site where developers, photographers, and other artists get products for their digital needs. It also has a professionally written code that is clean, a fully responsive interface, and icon fonts with over 1,500 pixel icons to choose from. What Vinero probably lacks in uniqueness, it compensates for its quality support. Users who have downloaded Vinero not only appreciated the beauty of the theme but, also the friendly and responsive support team behind the theme. The support team can also attend to pre-sale inquiries, in case you are interested to install it. There is really nothing much to say about Tonal because it really is as simple as how minimalism should be. The good thing about Tonal is that it can be downloaded for free, compared to other themes that have to be paid for. Its layout is pretty straightforward -- it follows a vertical layout where the website title is at the very top, a small menu icon on the upper right area of the layout, and website content below. For the blog content, users can choose to have a photo accompany a blog entry, so the photo appears first before the title of the entry and then followed by the text. 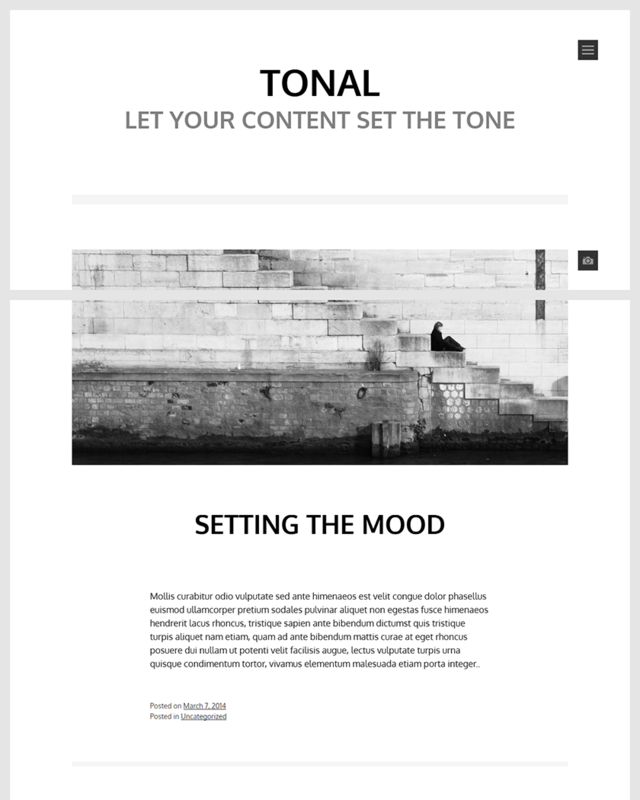 Tonal is perfect for blogs that really don’t want any frills. Other features include the capacity to have a sticky post or featured post, being translation-ready, and being customizable. Compared to other themes, Tonal is pretty limited in terms of customization, but that is precisely how minimalist it is. What is interesting about Concept is that it might not look minimalist initially, but it actually follows a clean layout that makes it minimalist in nature.The level of minimalism of your website with Concept, of course, depends on how you customize it, and there are so many ways to customize Concept, making it extremely versatile.It also has an image slider seen on the front page. What’s good about the image slider is that it doesn’t look overbearing. It blends in the layout perfectly yet the images still stand out quite well. Concept has social media and widget integration. Other important features include its compatibility with major browsers as well as its being responsive. 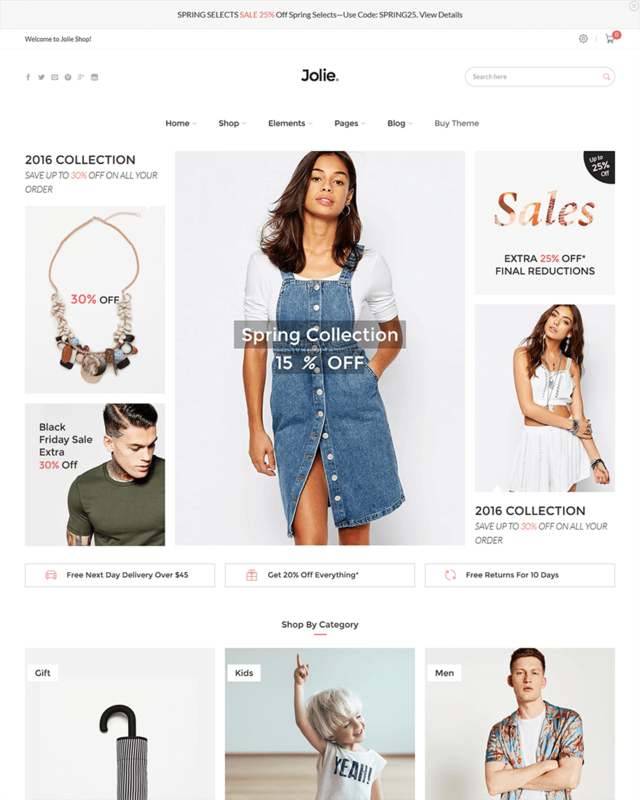 Given all these features, it is safe to say that Concept is perfect for those who want to build online stores, considering it is also WooCommerce integrated. Of course, the user can still opt to take advantage of Concept’s features for other uses, such as portfolio creation or setting up a company website. 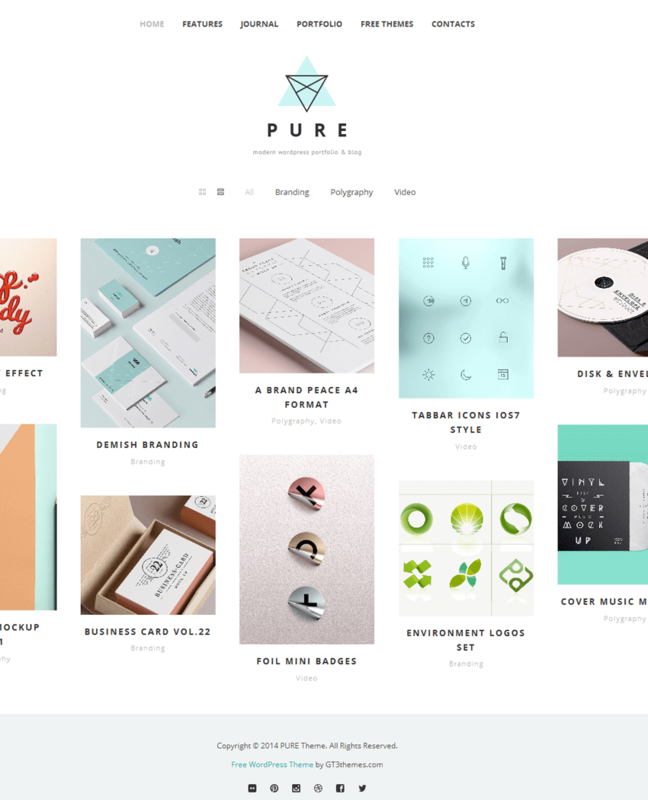 Pure is a very simple, clean and minimal WordPress theme which will help you to create a very professional looking portfolio website in the WordPress. The Pure theme shows the way modern and professional website style to look compose the perfect clean and minimal WordPress design of the overall concept. The theme Home Page has dropdown navigation menu and catching header which you can replace easily, as well as Portfolio in the content part and it’s arranged in the grid layout, and also it allow you can post your blog entries in different styles, such as Grid, Masonry and fullwidth, just like you set the portfolio page to display such as, Photo listing grid, All, Branding, Polygraphy and video. Pure WordPress Theme, also included About Page and 404 Error Page. Better is one of the most simple to use a minimalistic WordPress theme for your business! Characterized by pure simplicity, also, the theme is packed with a lot of high quality features such as shortcodes, layout builders, theme options, sliders, it can become the perfect solution for your online portfolio. 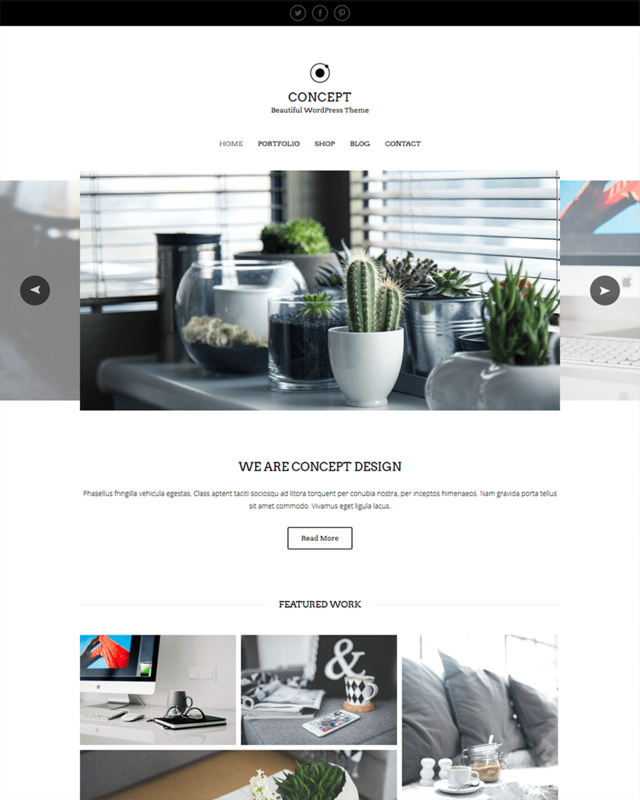 This portfolio theme is a minimalist and neat portfolio WordPress theme, a great choice, we have already featured this theme in our previous WordPress theme collections. 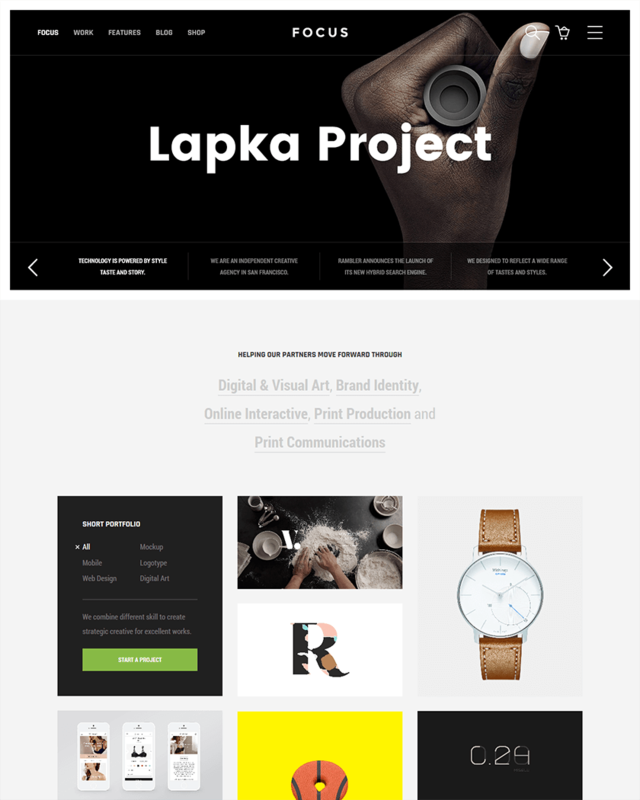 You can see here: we listed it in the best portfolio WordPress themes. 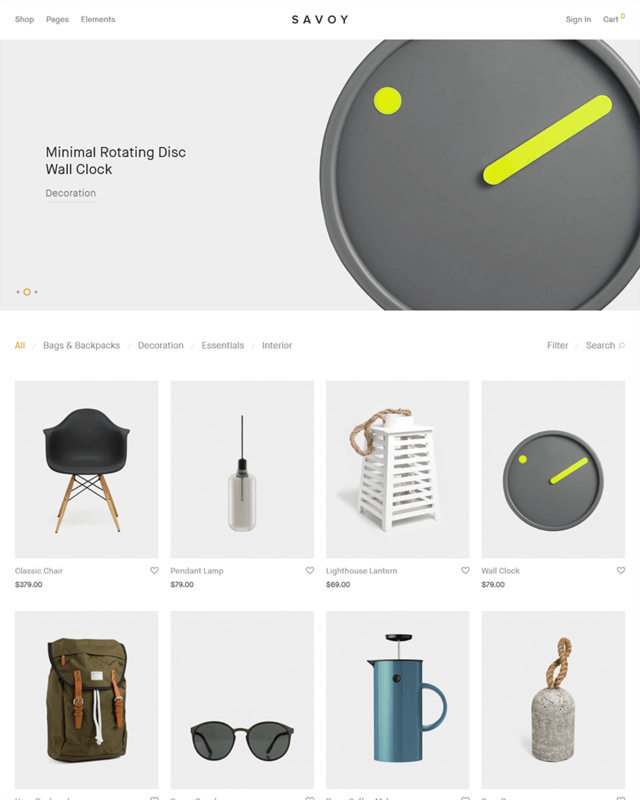 Aurum is minimalist WooCommerce theme that will give you and your customers a smooth shopping experience which can be used for various kinds of stores such as boutiques, bookstores, technology stores, jewelries and other types of web shops. It is beautiful, flexible and super fast theme. You can select multiple site variants or create your own skin easily with the skin builder. Currently it has 4 demo variants and counting. The Aurum is responsive and retina ready works perfectly with any device on any size PC, tablet or smartphone with all the touch sensors. High-quality images and fonts and texts. 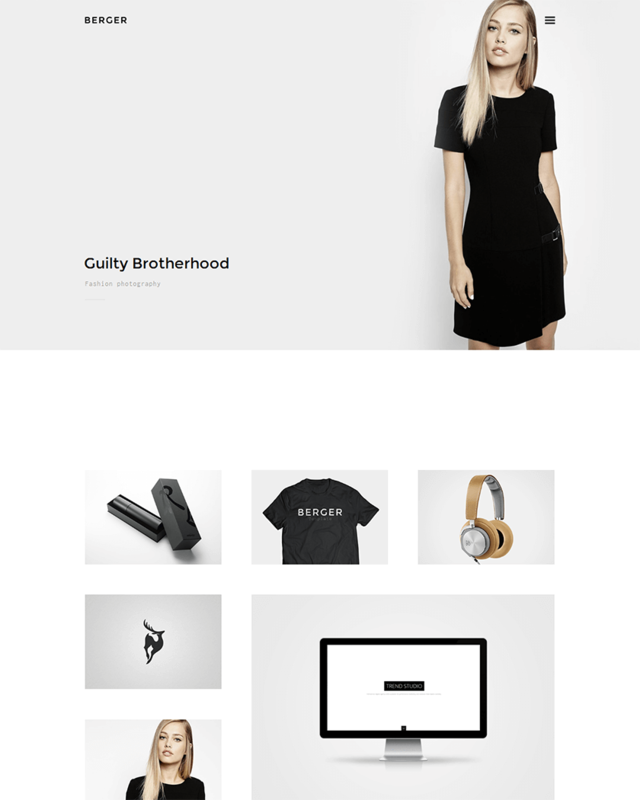 Berger is a creative and very professional looking minimalist wordpress theme for agency, graphic designer, freelancer, photography. The template is fully responsive and works great on all screen sizes and mobile devices. This is the template which is fully localized support which makes translation to multiple languages with WPML compatible. 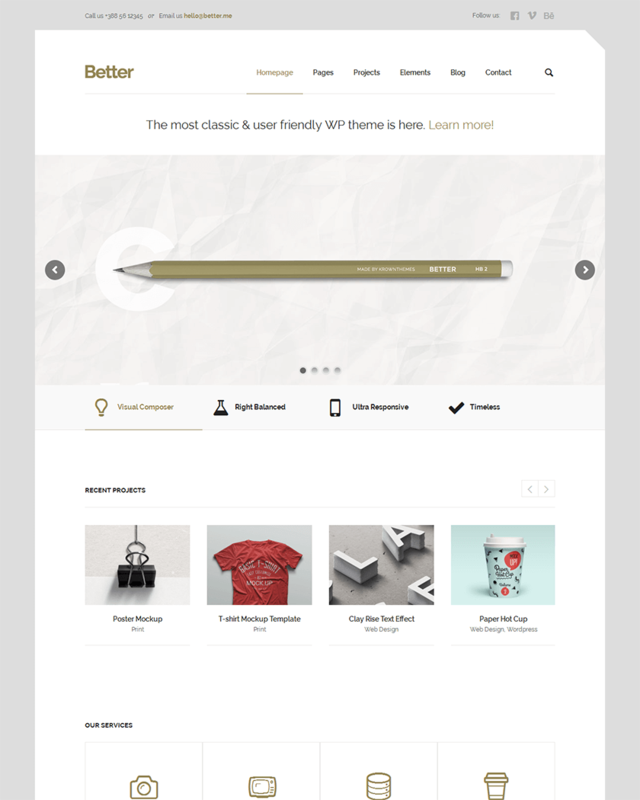 NinetySix is Clean, Creative, Professional Theme If you are looking for fresh Shop and Portfolio, Blog based website. This template includes fully equipped demos, which can be easy to import and highly customizable. 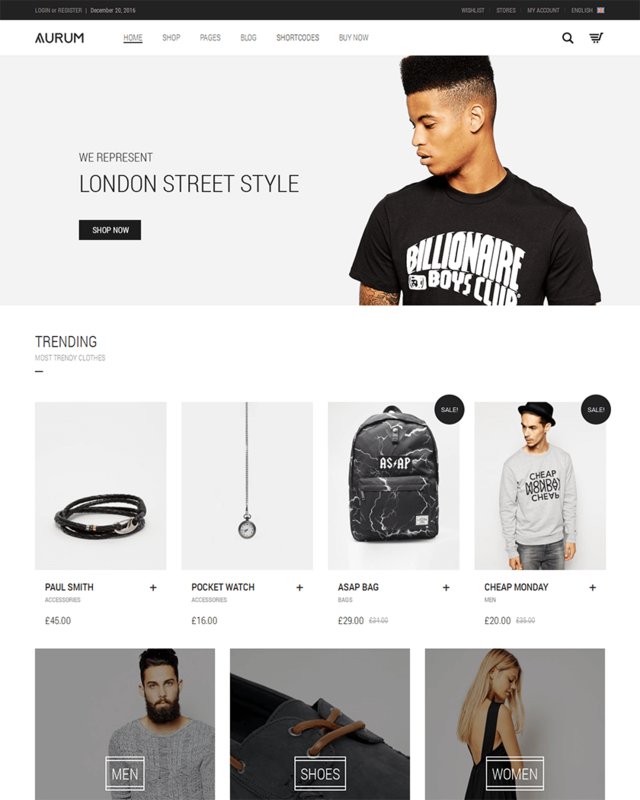 This theme is WooCommerce compatible and lot’s of page layouts can help you build awesome online shop. 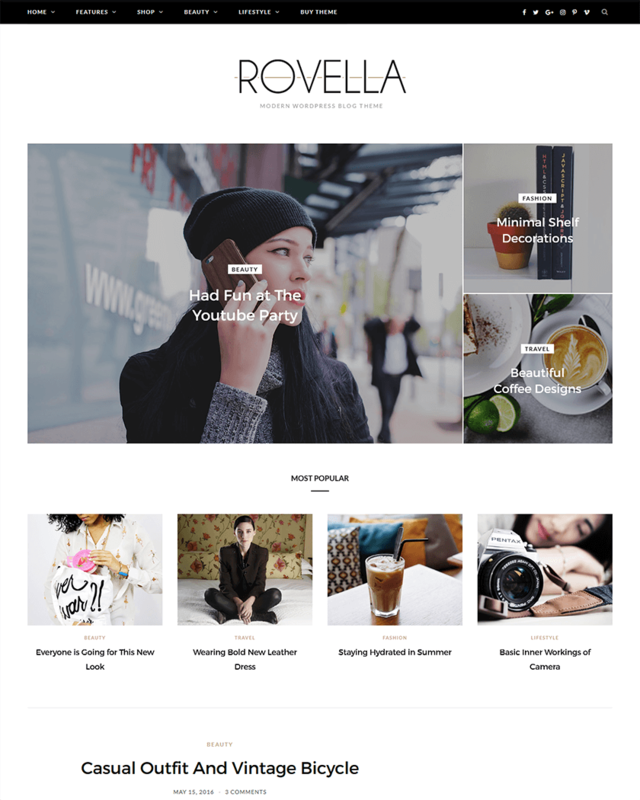 The template also has highly editable portfolio and blog layouts with clean and minimal style to build awesome portfolio or blog website. Hello, thank your for this. We use CheerUp for our travel blog and it’s perfect. Truly recommended.